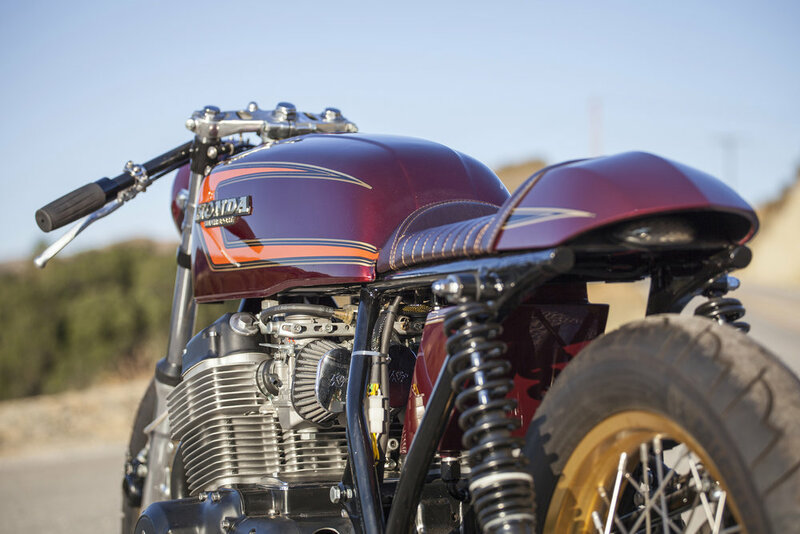 This Bike was featured at Pipeburn.com (Click here to view) - Written by Martin Hodgson. For any artist there is a fine line between allowing yourself enough creative space to fulfil your passion and doing the work that puts food on the table. 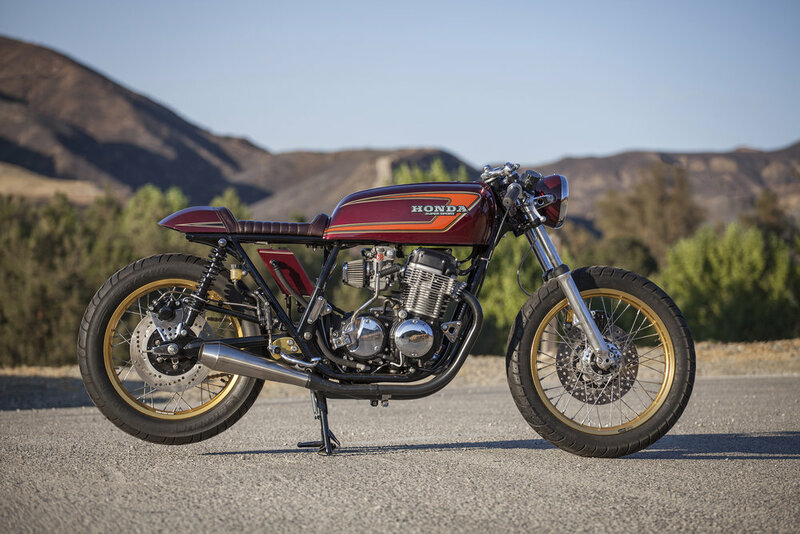 For Dustin Kott that involves the delicate balancing act of working at the major Hollywood studios while still giving time to his artistic endeavour, Kott Motorcycles. There is also the small fact that he’s a perfectionist, a time-consuming trait. 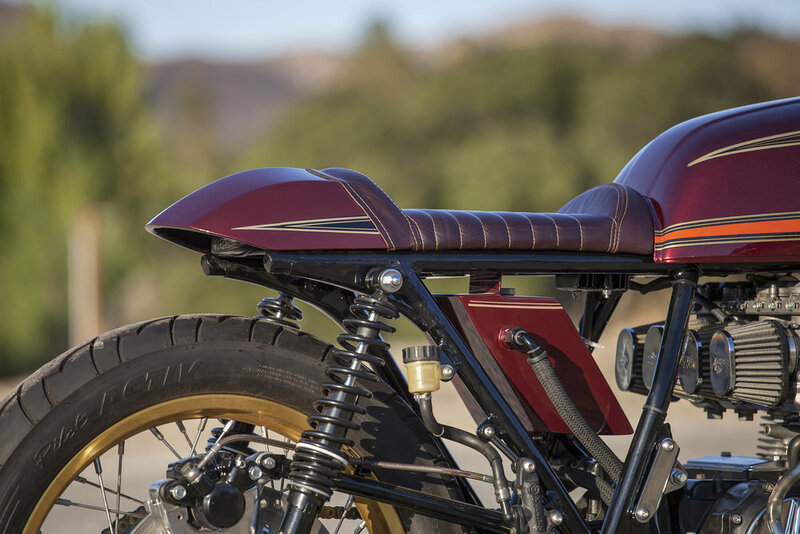 But that hasn’t stopped him from proving you can in fact improve on perfection; four years since the completion of a Honda he called Ruby Red, Dustin’s back with an homage that raises the bar to all new heights. 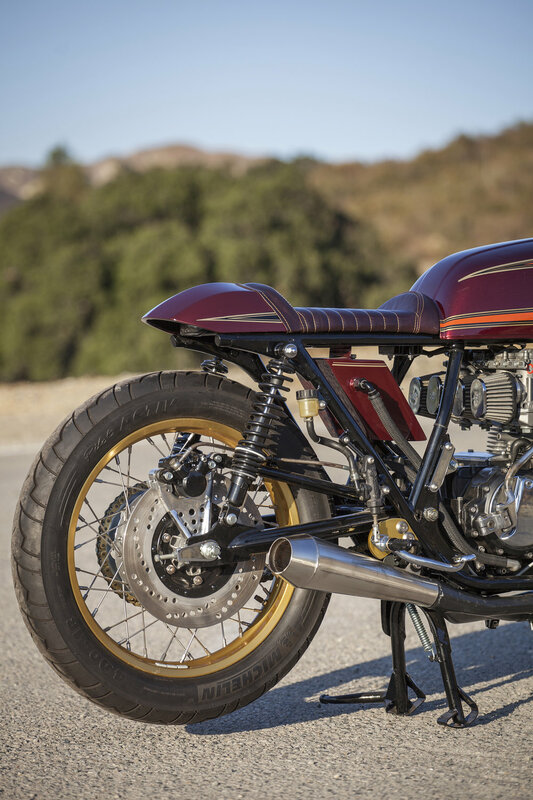 An elite level cafe racer, Ruby Gold is a 1978 Honda CB750 Super Sport that’s flawless in fit and finish. 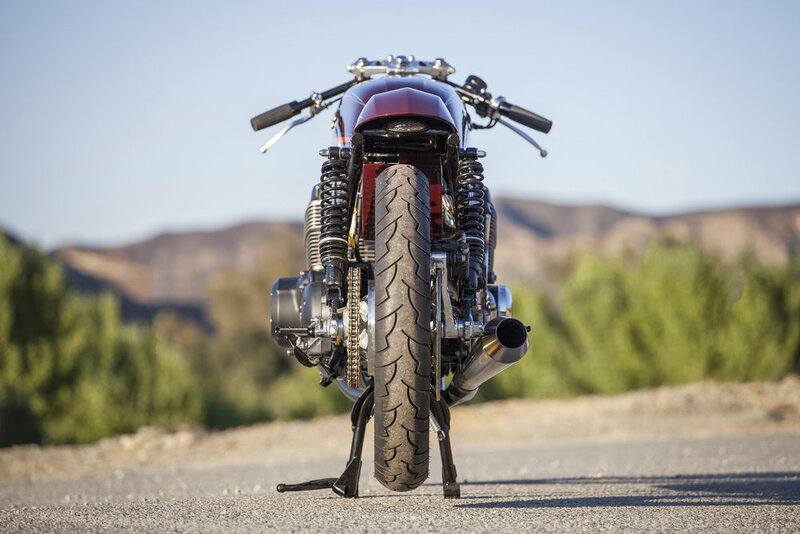 “It’s a rare one for me to work on in that it is a 1978 Super Sport 750. I’ve historically avoided this particular year due to its ever-increasing stylistic queues harkening toward the 80’s era of motorcycles. With its stock Mag wheels, less attractive front end and tune proof carbs I usually pass on taking on this bike,” explains Kott. But with the bike shipped down to So Cal by its owner in Oregon, Dustin saw a unique challenge to build a sister bike to the previous 750 SS and show himself and the world how his building skills have evolved. That oil tank is a sight to behold, the external unit no distraction from the negative space that many seek to see evident in the void below the seat, but an incredible addition. Seeming to almost float in its location, each line matches with parallel perfection to the corresponding line on the frame. A machined filler cap, braided hoses and high ended automotive fittings ensure the piece isn’t let down in any way. The last of the paint work is reserved for the bucket of the classic headlight that wears a chrome bezel. While the seats dark chocolate-brown leather is stitched together with gold thread for the final touch of continuity. But having gone to such lengths to make the visuals of the bike appeal, Dustin’s dislike for the stock wheels meant a change was a must. The switch from mag wheels to spoked items is no easy task, especially factoring in the rear normally supports a disc brake. The conversion got off to a good start with a 1975 K model rear hub located in the shops rafters. Then it was over to the lathe to make spacers and find a way to make the disc fit. The finished result looks like it was always meant to be with the wave pattern drilled rotors giving a distinctive custom touch. Activating the new assembly is one of Kott’s favourite aspects of the build and a true amalgamation of old and new. “Even though the fitment of the Brembo master cylinder and associated linkages looks simple, the thought, balance, operation and simplicity required took quite a bit of thought.” Replicated on the left side for gear shifting, the Honda has a retro tech appeal with high-end function meeting classic looks. The rear suspension is given a quality upgrade with progressive rate spring over shocks, while modern Michelin rubber gives superb road holding wrapped around the gold colour matched rims. 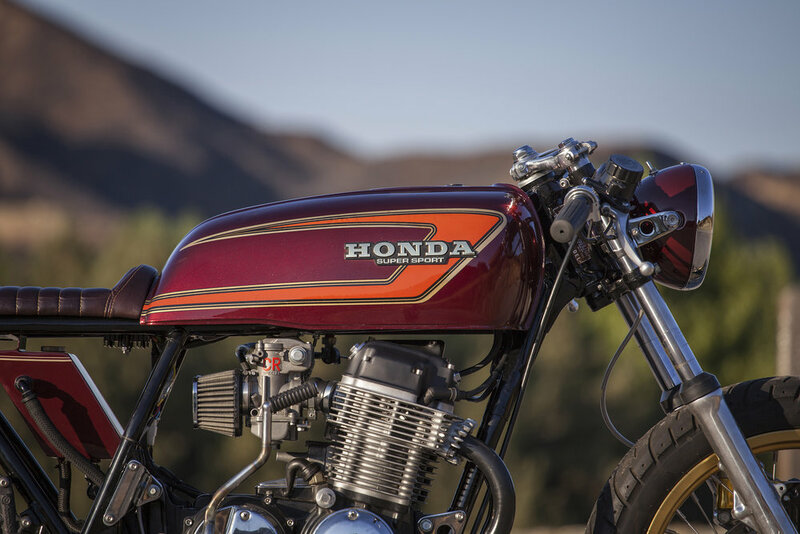 By 1978 the single cam 750cc Honda four cylinder was in its last days but to keep the American market happy the Japanese engineers had made some special tweaks. And Dustin doesn’t let them down by giving the motor some extra hop and a factory fresh finish. A mix of black cases, metal finished barrels and chrome covers gives the engine the hot rod feel. While a set of Keihin CR carbs give it the fuelling it needs to give it the go. The headers are heat coated to match and finish out the back with a bark thanks to a raw steel reverse cone muffler. A set of clip-on bars with twin cable throttle mechanism controls the power and things are kept clean and simple up front. A new set of levers, old school grips and braided lines get the job done without any fuss. The finished cafe racer is everything that was great about Ruby Red with the addition of four more years of Dustin’s evolution as a builder. “I like the concept of seeing two machines side by side from different eras of personal development. 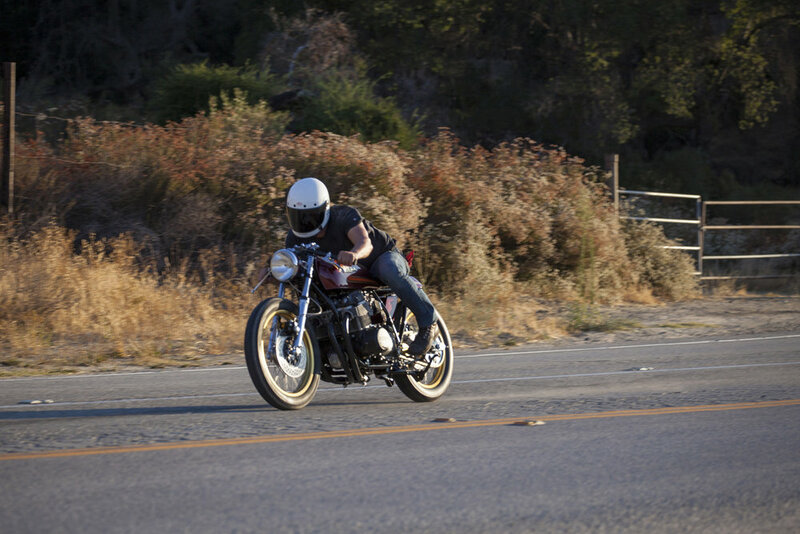 It gives one the opportunity to notice improvements and refinements amidst such similar outcomes.” It’s hard to see how things can get any better from here, but one thing about Kott Motorcycles is that when Hollywood isn’t calling, Dustin is constantly on the quest to go to an all new level. © 2018 Kott Motorcycles - All Rights Reserved.